Local steel industry is projected to enjoy a growth rate of some 10 per cent during 2019 which would be primarily driven by two key projects in the central region, the Ministry of Industry and Trade has said. 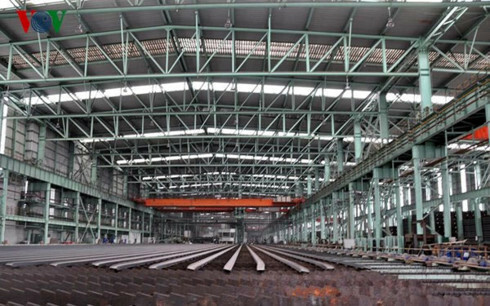 Newswire baodautu.vn cited a report by the Ministry of Industry and Trade (MoIT) as saying that crude steel production was estimated to be at 1.68 trillion tons in March, a huge rise of 56.4 per cent on year while rolled steel output reached 506,000 tons, up 13.5 per cent on year. The manufacturing of steel bars and steel angle stood at 522,000 tons last month, a slight increase of 0.6 per cent on year. The March figures have enabled the first-quarter output of crude and rolled steel to increase respectively by 64.8 per cent and 6.1 per cent on year. Despite the growth in March, the production of steel bars and steel angle fell slightly by 0.5 per cent. The MoIT noted that the steel industry was expected to enjoy good growth this year, making a significant contribution to overall economic growth. The steel sector’s growth could be attributed to a steel mill developed by the Taiwan-invested Formosa Ha Tinh Steel Corporation. The Formosa factory, based in Vung Ang Economic Zone in the central province of Ha Tinh, is scheduled to put into full operation two blast furnaces this year, with a combined capacity of 7.5 million tons per year. Last year, the project was estimated to yield a capacity of 4.5 million tons. Another driving force comes from the Dung Quat steel factory in Quang Ngai province which has enjoyed investment from the domestic industrial manufacturing Hoa Phat Group. The mill is set to make its first blast furnace operational by June, the second one in September, and the third in December. When at full capacity, the project could yield 2 million tons of steel per year.